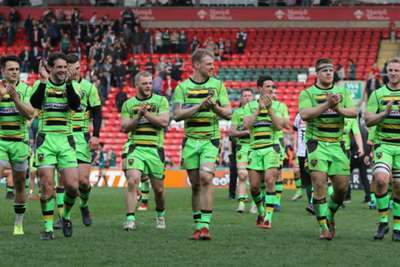 Northampton Saints halted fierce rivals Leicester Tigers' winning run with a surprise 27-21 Premiership victory and Wasps moved up to third with a win over Worcester Warriors on Saturday. A five-match winning run had the Tigers marching towards a semi-final spot, but Northampton stunned an expectant Welford Road crowd with a spirited display a week after suffering a humiliating 63-13 drubbing by Saracens. Northampton had lost four Premiership games in a row prior to making the short trip to face their foes, yet they showed great character to complete a double over the Tigers. The Saints were heroic in defence and had a cutting edge in attack, Ben Foden going over for the opening try in the left corner after the visitors lost Rob Horne right at the start when the stand-in captain took a nasty blow chasing down the kick-off. Telusa Veainu went under the posts at the other end following a powerful run from Ellis Genge and Leicester were in front when Matt Toomua dotted down, but Northampton led 17-12 at the break after the influential Cobus Reinach burst through to finish off a clever move. Ahsee Tuala stretched Northampton's lead by steaming over for their third try and three George Ford penalties were all Leicester, who welcomed back Ben Youngs, could muster in the second half, a late Jonah Holmes try ruled out for crossing on a frustrating day for Matt O'Connor's side. Enjoy that one, did we?! Wasps capitalised on the Tigers' slip-up to move above them and Newcastle Falcons with a 30-15 bonus-point success over second-bottom Worcester. Christian Wade claimed a double and Joe Launchbury also went over to give Dai Young's men a 23-3 half-time lead. Josh Bassett added a fourth, with scores from Dean Hammond and Josh Adams in vain as Worcester remained nine points above bottom side London Irish. Gloucester are just two points adrift of Leicester and four behind fourth-placed Newcastle after thrashing sorry Harlequins 37-9 in the London club's first game since it was announced that director of rugby John Kingston will depart at the end of the season.